I've been wanting to write this post for ages, at least since I started this blog. Given my passion for illustrated books, one of the questions I've been asked more frequently is about which baby books to buy first, and whenever a friend becomes a parent, books are usually my first choice as a gift. 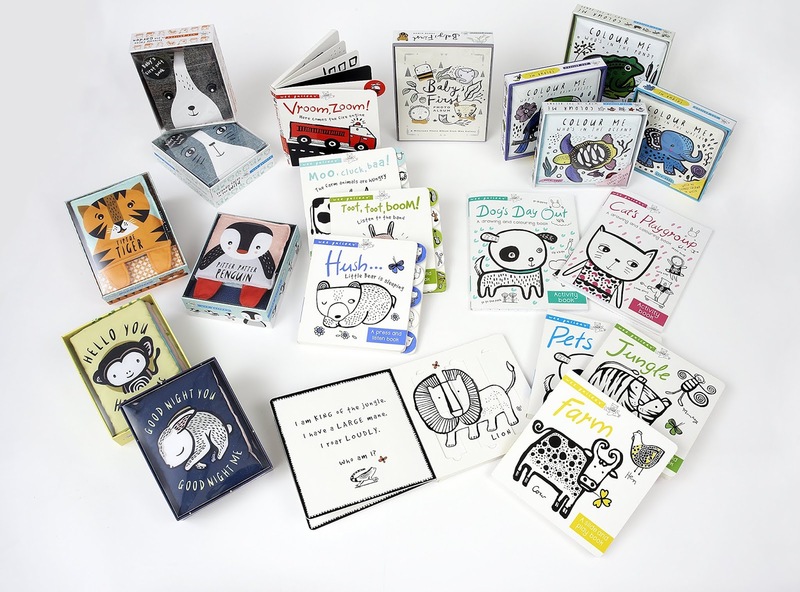 But this isn't an easy one, as there are so many wonderful books out there, and making the ultimate baby books list is a quite pretentious idea. Most of the above will soon reach a lucky tiny human and his parents. 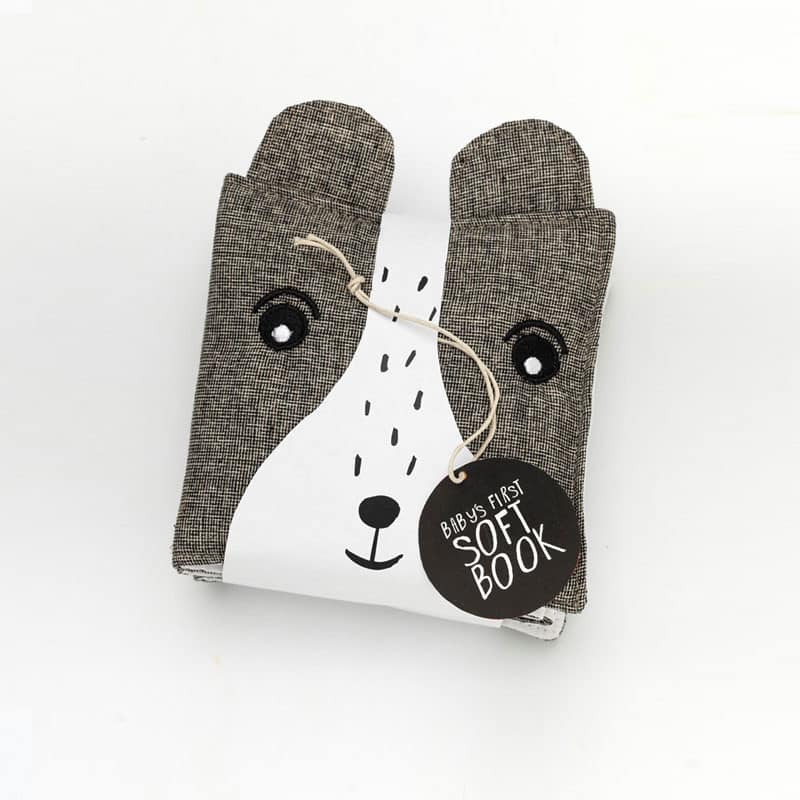 As very first bookI picked a black&white cloth book from the beautiful First Books series created by Wee Gallery (Good Night You, Goodnight Me is also a great one to look into, it has mirrors and it can be an early bedtime book). 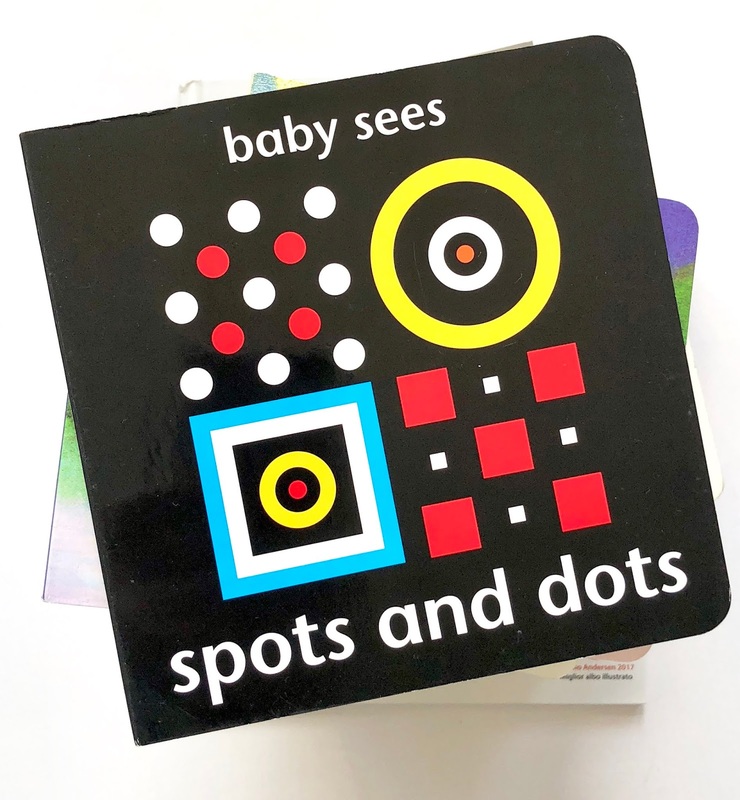 A title from the series Baby Sees by Chez Picthall, which features patterns, shapes and colours to accompany baby's brain development through visual stimulation. 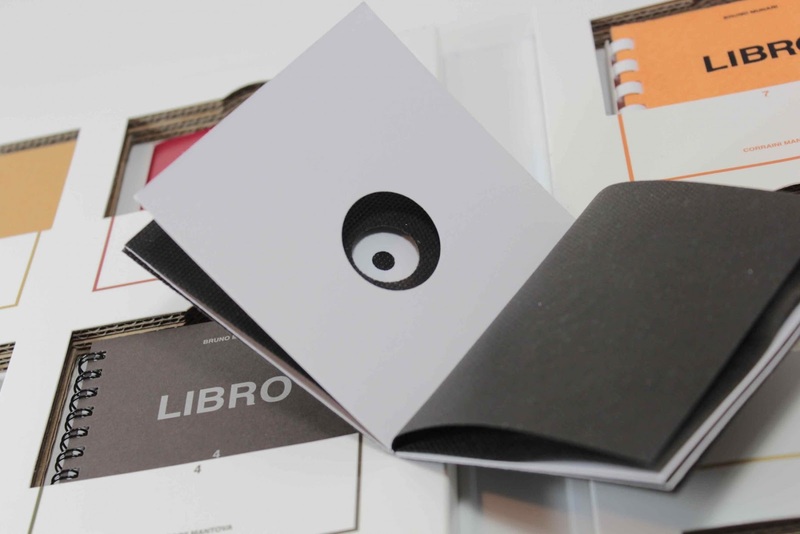 There are a few titles on the market conceived around the same idea, on the model of Munari's Pre-Books , which were small (10x10 cm) cult books published back in 1980: each of them offered a variety of tactile and visual stimuli. Publisher Corraini is now reprinting them (yay!). Il Tondo by Iela Mari  is a celebration of the perfect geometrical shape: the circle. It's a word book and a visual exercise too, based Mari's assumption that young children think and explore the world through shape associations. The recommended age is 2+ although I offered this book to my daughters much earlier. The repetition of the word 'round' as the images change is what captures the child's attention, especially as he is learning to speak. A highly enjoyable book for babies and toddlers, suitable to read aloud as well as for independent reading. All the other titles are short stories on board book editions which can be approached from 9 months and will work well until the baby turns 3 as they offer different reading levels. 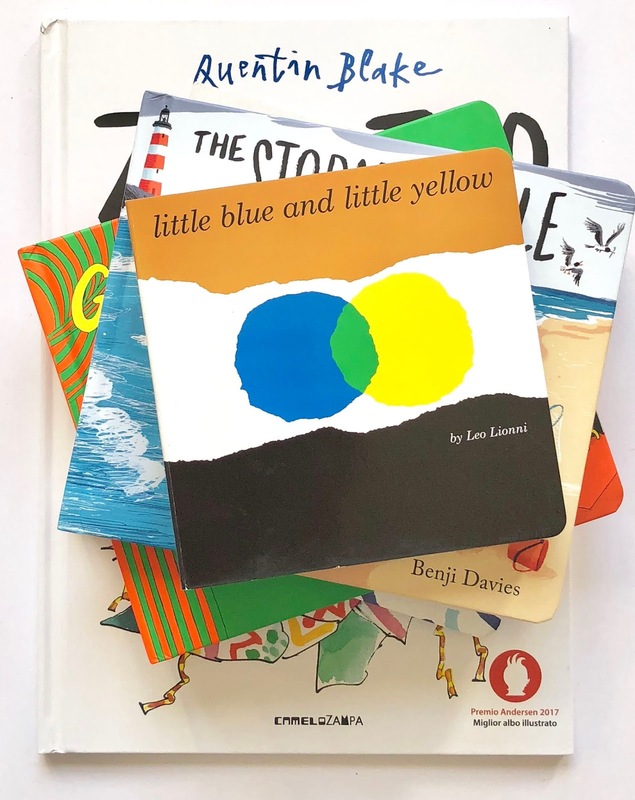 Leo Lionni's cult book Little Blue Little Yellow  combines shapes and colours to a sweet, timeless story about identity, acceptance and friendship. Unmissable. 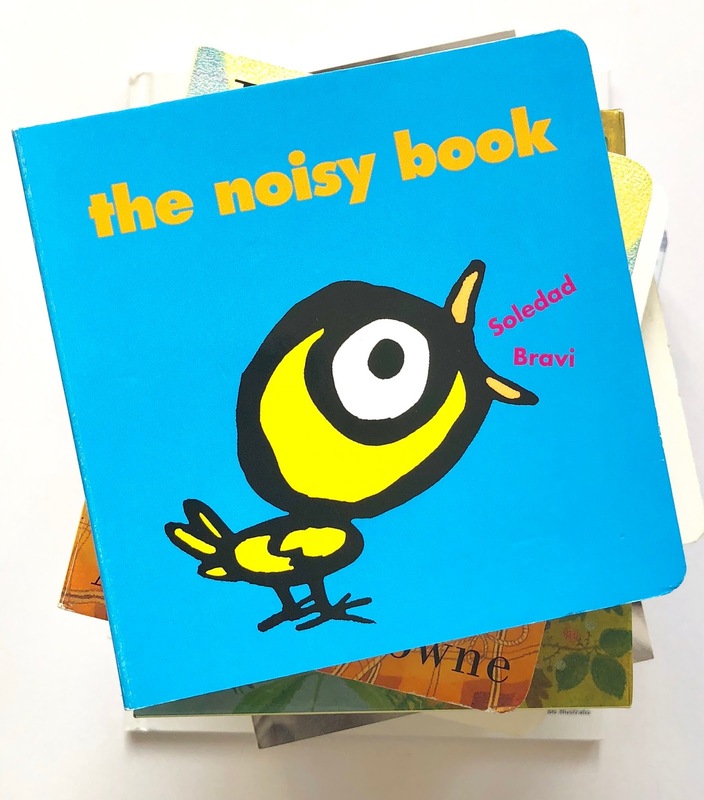 The Noisy Book is a classic, much-loved title by French illustrator Soledad Bravi: perfect to encourage babbling, speech and language development as babies are encouraged to associate sound and image and to reproduced the sounds in the book. The idea is so simple yet so effective: babies and toddlers can easily get obsessed with this book. Our copy is worn out and saved us during many trips and long waiting in restaurants. It's a must-have. A note on the Italian edition: this includes a few sounds that are not present in the English-language edition (like gun), while some are translated differently (spinach is 'yum' in English and becomes 'bleah' in Italian). I spontaneously used to skip these when reading the book as we had the Italian edition, as I don't feel these were appropriate concepts to pass onto a baby:). If it's an option for you, go for the English edition. 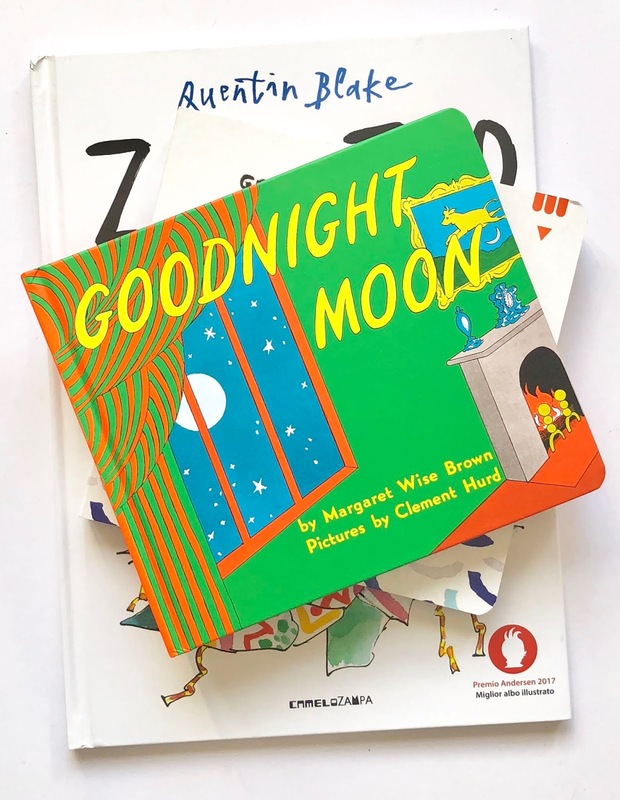 Goodnight Moon was written 70 years ago and is still the best book to lull children to sleep. I have read it and still read it at bedtime, and never get tired of it, it's a kind of magic:) I had previously talked about it here. 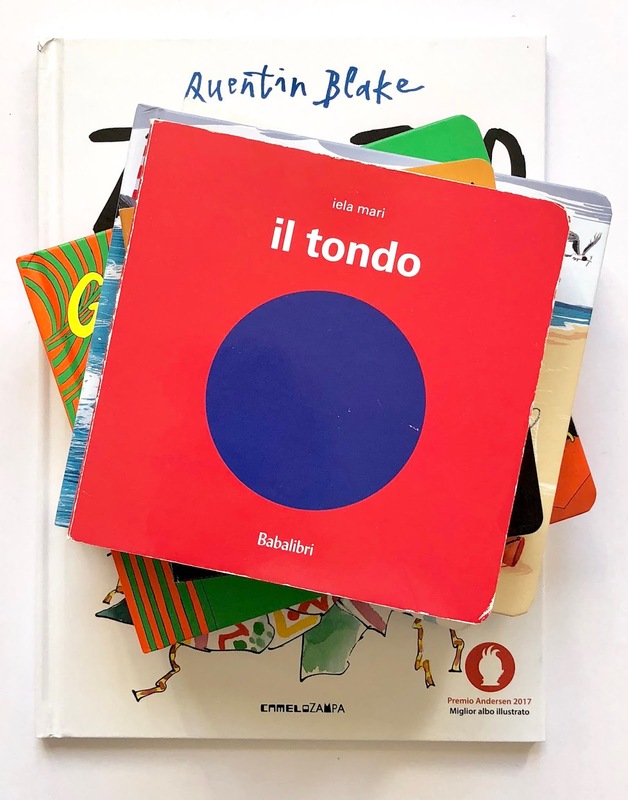 Goodnight Moon has recently been translated in Italian, although I am not sure on whether the musicality has been effectively transposed in Italian. So again, if it's an option for you do buy the original edition in English. 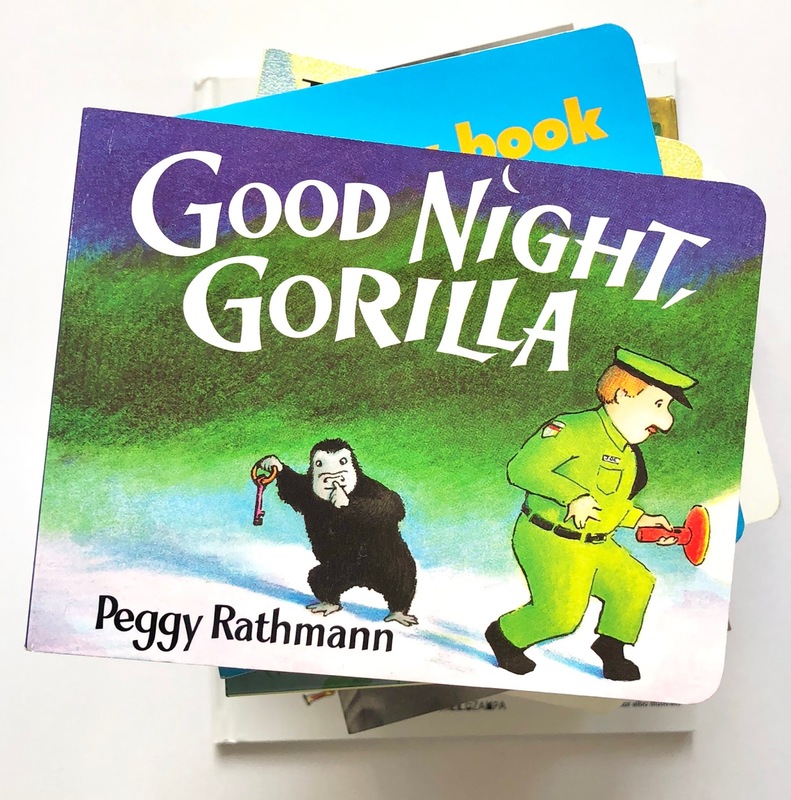 Goodnight Gorilla is book with almost no words telling the story of a young Gorilla who frees his friends from their cages to join the zoo keeper and her wife for a comfy sleep in their bedroom. 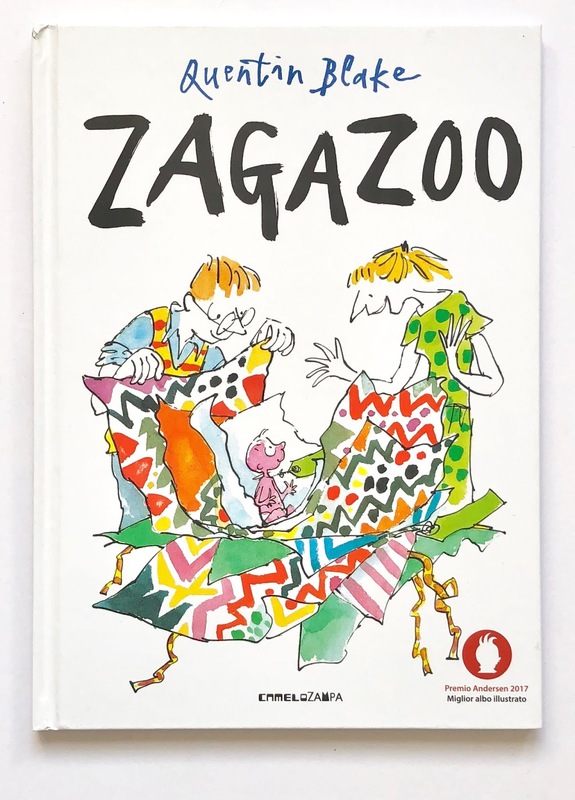 A very special book that captures children's attention through repetition, stimulates observation and interaction and that's also great fun for little ones, thanks to an ever-amusing final coup de theatre. This is a must-have for any baby and toddler. Buy a hardback edition or board book as it will need to survive multiple readings. There is no Italian edition of this title although I feel any non-English speaker will be able to read it with no problem at all. 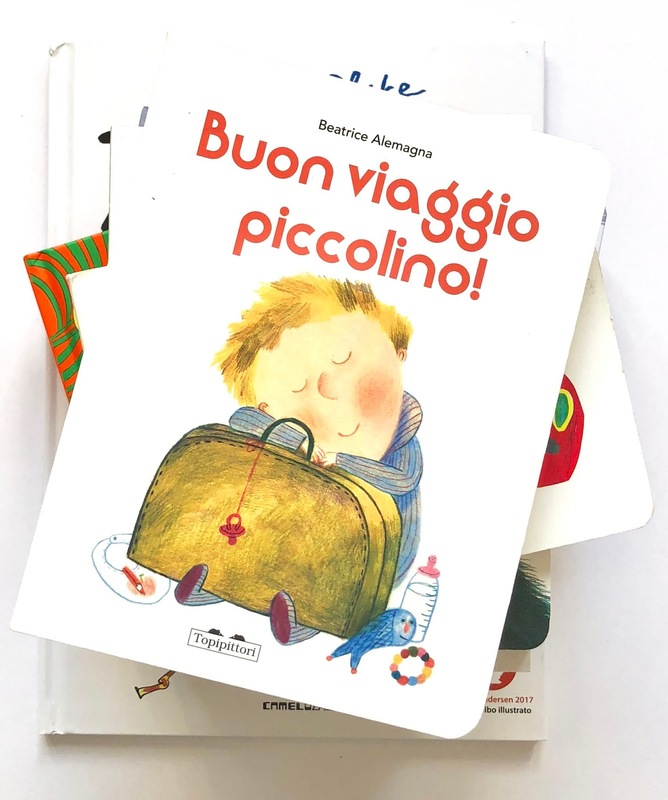 Buon Viaggio Piccolino is a sweet bedtime story created by award-winning author/illustrator Beatrice Alemagna and her only board book. We follow a one year old in his bedtime routine from bath to bed and as he goes through his bedtime essentials. Just perfect to encourage little ones to do the same when they wind down. I talked about it here. The very hungry caterpillar is a much-loved classic that sold millions of copies worldwide, telling the story of tiny greedy caterpillar who turns into a beautiful butterfly as he finally gives up human food for healthy leaves. With its die-cut pages and finger-sized holes to explore, this is a deeply engaging book for little ones. Go for the board book mini edition, that can easily be held by babies and young toddlers providing a greater satisfaction. 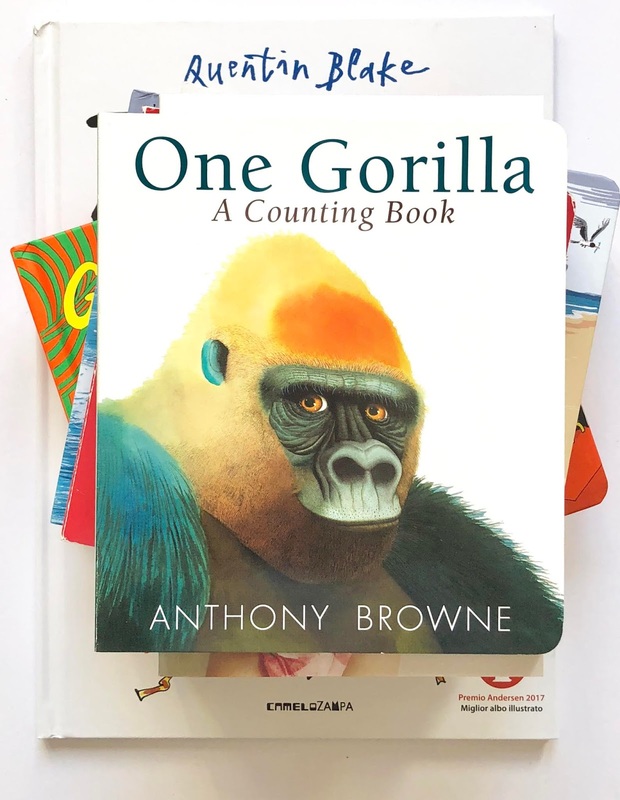 In One Gorilla, A counting book former Children's Laureate Anthony Browne encourages children to explore the numbers from 1 to 10 as they also explore 10 primates species. Enchanting and beautifully illustrated, this book condenses Browne's well-known love and respect for our primates relatives. Something we should urgently pass onto our children, as humans are destroying their habitat at shockingly quick speed. Why did I choose My Dad instead of My Mum ? :) My daughters actually love them both and they are both real fun. However, Dads are usually (usually!) those who get to spend less time with their children and books are a great way to support the father-child bond in that very short daily story time slot. That's probably why books celebrating dads are more abundant. 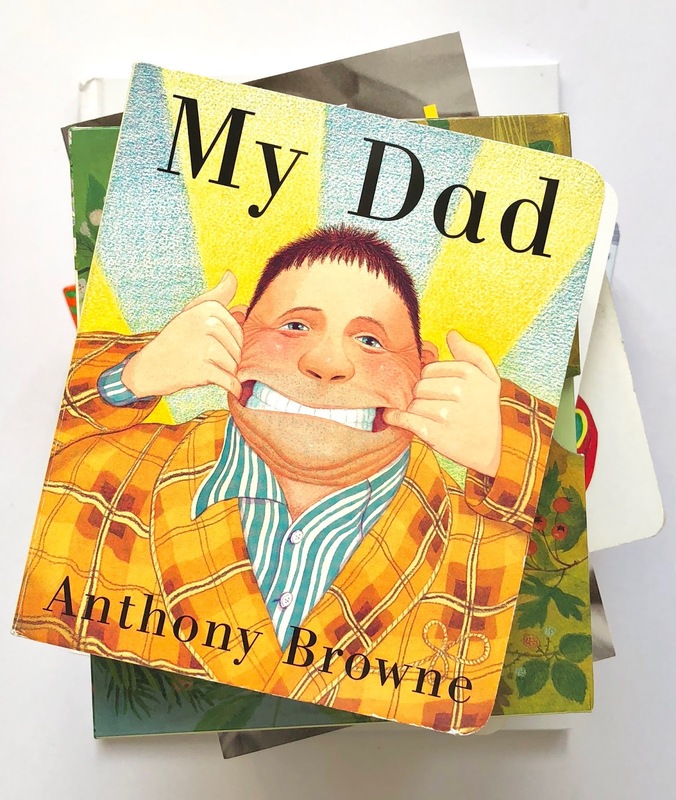 My Dad is filled with Browne's signature visual humour, which develops on the repletion of dad's night robe pattern, and is a perfectly reassuring tribute to fatherly love. I still haven't fully understood why talented and quite irreverent Italian author/illustrator Get Tessaro is unknown outside Italy. Because we love his books! 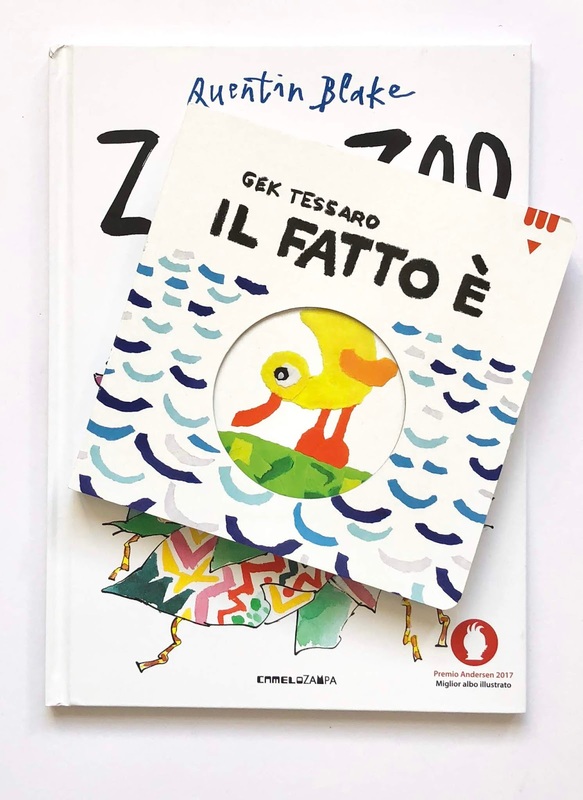 Il fatto e' ['The fact is..'] tells the story of a duckling who really doesn't feel like jumping in the water. The more the other animals try to push her in, the harder she resist, until everyone falls in, except for the duckling of course, who will finally decide to swim in peace as soon as everyone is gone. Children love the structure of the story and the exciting, fun and happy ending, identifying with that offbeat duckling. 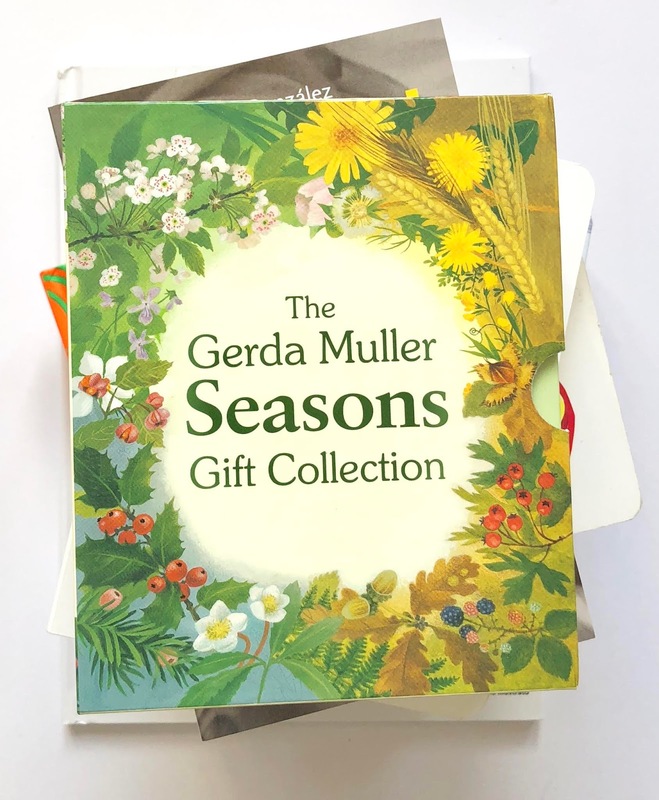 This lovely Gift Box includes the four board books of the collection Seasons, by German author/illustrator Gerda Muller, in a mini edition perfect for small hands. 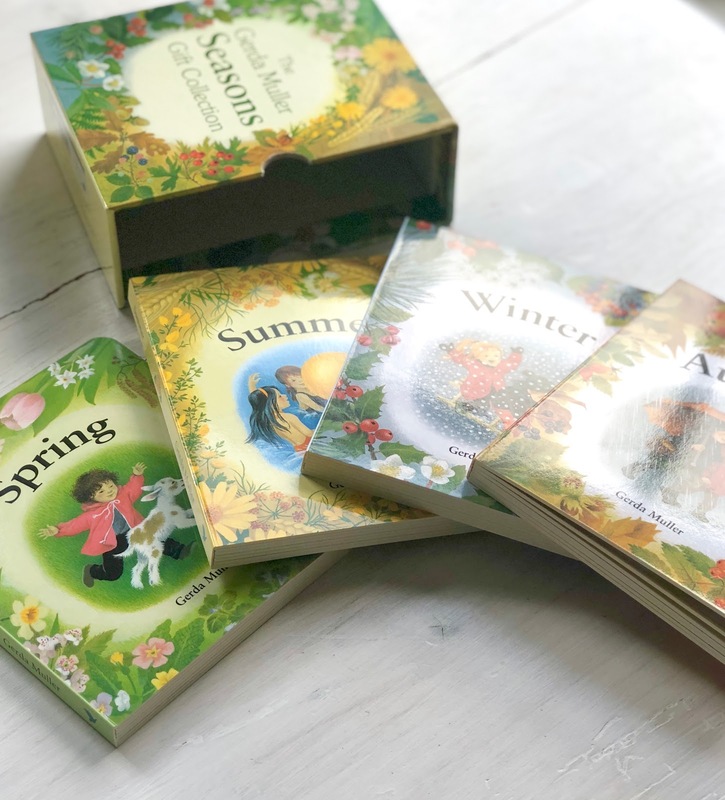 Each book features seasonal illustrations and no words, presented with Muller's much-loved retro style. 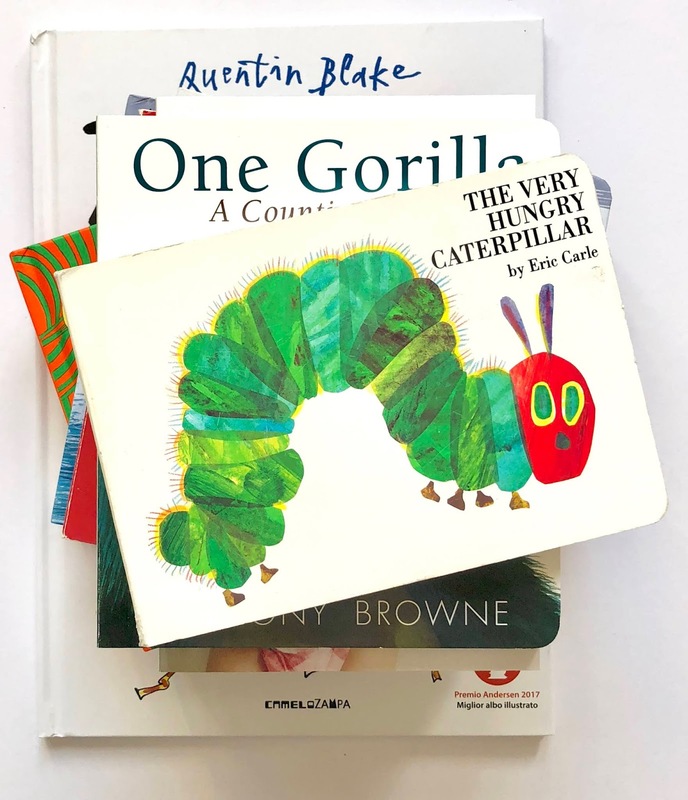 I particularly like silent books for toddlers: they encourage independent reading and interaction with the images, and they can inspire parents to tell ever-changing stories around the illustrations, if they are quite descriptive like in this case. This is also a perfect introduction to the concepts of seasons and time for babies and young children. 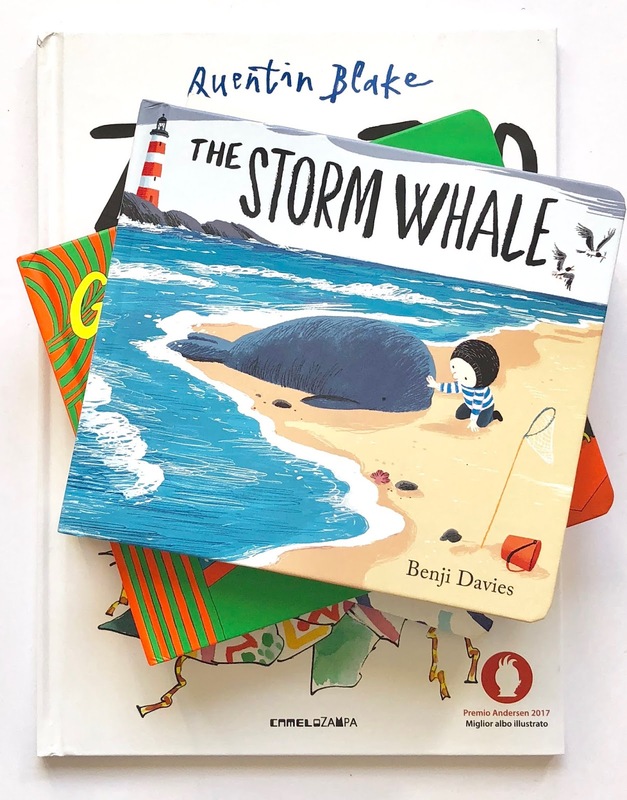 I'm not sure The Storm Whale needs an introduction:) The story of how little Noi rescues a baby whale returning her to sea has enchanted children of all ages since it was published in 2013, and it's been translated in several languages becoming a classic already. The recommended age is 3+ although this is definitely a book that can and should be offered to toddlers aged 18 months+ (the board book edition is in fact very popular). Finally, some books for new parents, because the amount of parenting books out there can be overwhelming. The fact is even informed parents have no idea of how everything will work until they actually have children. They have no idea of the number of choices they will make, especially in the first years, and how many choices can actually affect their child's life in the future. When I was pregnant with my first daughter a friend (who I then elected my 'maternage guru':) gifted me the bestselling book Kiss Me! 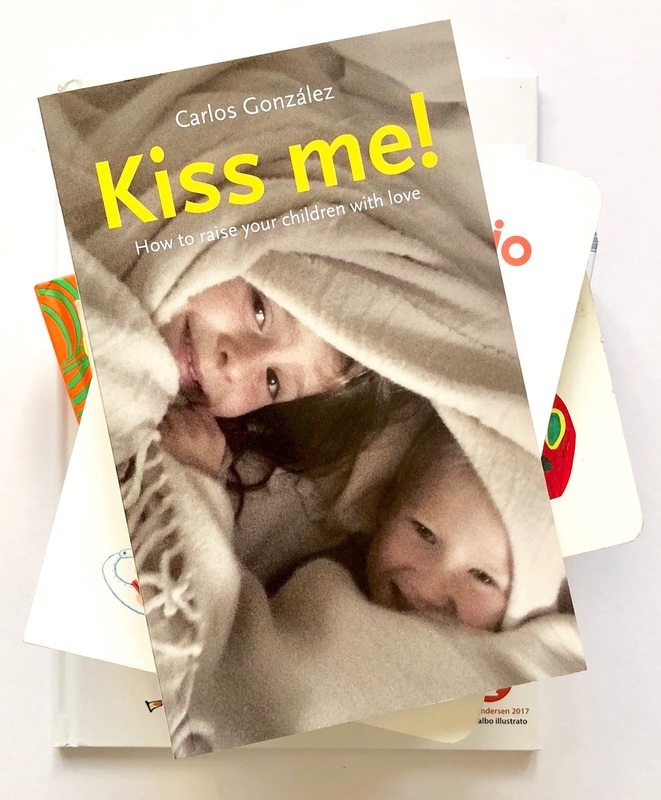 [Besame Mucho] written by Spanish paediatrician Carlos Gonzales. Kiss Me! is a first guide to respectful parenting: it's a book in defence of children, based on the assumption that all children are 'good', sociable and honest, and they deserve all the love that we can give them. Dr. Gonzales tackles a few hot topics like breastfeeding, sleep, co-sleep and discipline based on rewards and punishments. The book has become the attachment parenting manifesto, as opposed to books like The Baby Whisperer, by Tracy Hogg, advocating parenting styles based on strict routines and sleep training techniques. The fact is if you read Kiss Me! first, everything will make so much sense that you will not really be able to embrace much of Tracy Hogg's method. More importantly, this book will set the basis for future readings, helping new parents to get out of that mountain of parenting books. Because let's face it, when we become parents we are no different from the person we were before, yet there's a lot to learn (there is:). Talking to other parents and getting informed by choosing the right books is essential to actually feel that we are doing a decent job as parents. I have gifted this book to all my friends who were expecting a baby, and it's still the one title I would like everyone to read before starting their parenting journey. 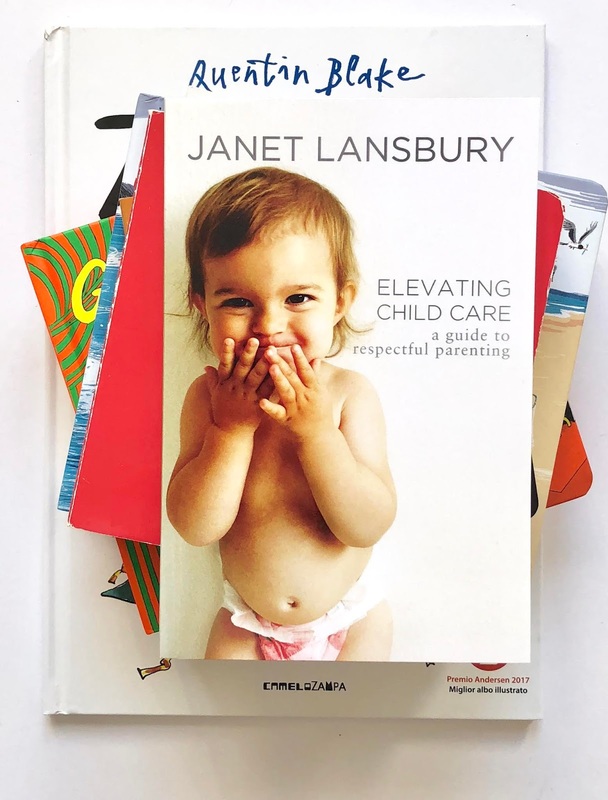 Elevating Childcare naturally follows Gonzales' book as Janet Lansbury's advice on respectful parenting is set on the same principles. There are no bad kids. Kids must be observed, and deserve all our respect as fully capable human beings. Lansbury embraces the RIE philosophy, developed in the 60's by Hungarian-American early childhood educator Magda Gerber and inspired by the innovative theories of Gerber's own mentor, paediatrician Emmi Pickler. Although technically different and with different practicalities, RIE and Montessori philosophies share the same trust in the child as an initiator, an explorer, and a self-learner, and the same focus on the environment, which should be physically safefor the child, cognitively challenging and emotionally nurturing. Read and gift her books, follow her on social media and take the time to read her blog, Janet will be your daily source of inspiration as a parent in those first challenging years. This last one is for parents too:) Zagazoo tells The story of parenting and the story of child care phases through an hilarious metaphor, reminding all tired parents that all this shall pass, including this young version of ourselves, encouraging to laugh as we journey through this tough, exhausting, apparently never-ending parenting adventure. So let's try to make the most of it, and enjoy our tiny humans before they're gone.